Nearly two weeks ago, A-specto magazine revealed that Gabriel’s rent was only BGN 400 a month for an apartment of 128 square meters in a luxury building in the Sofia upscale Lozenets district. The landlord was the municipal company Zavodproekt. Maria Gabriel, herself, confirmed these facts and indicated that she had terminated the contract for the cheap housing in May 2013. GN 400 per month for 128 square meters in this luxury building in Lozenets are not an unbearable rent for a MEP. However, a check by Bivol further revealed that the “help” requested by Gabriel, probably from the Sofia Municipality, was not even mentioned in her declaration as a MEP. Why she missed doing it remains unclear. Doubts, raised by A-specto that Gabriel continued to use the housing in one form or another despite the formal termination of the contract also remain uncontested. 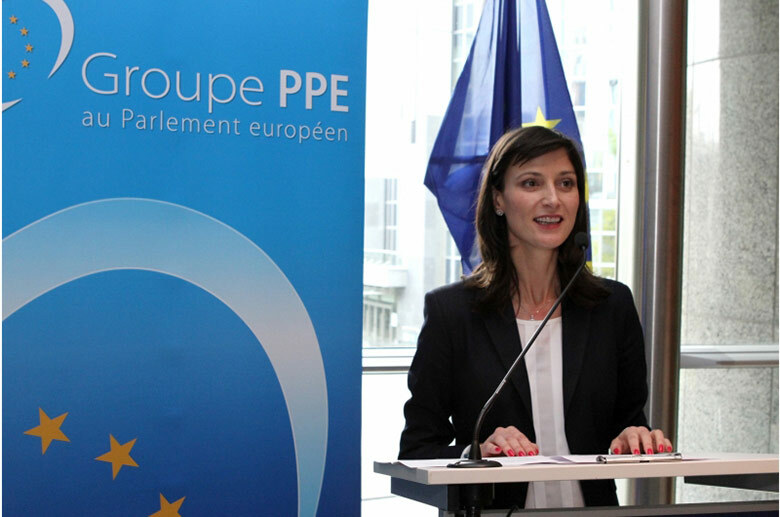 Bivol sent several questions to the press office of Gabriel’s ruling, center-right party Citizens for European Development of Bulgaria (GERB) and to the future EU Commissioner, herself, for further clarifications on these gray areas in the history of assistance granted to her as MEP. All queries remained unanswered. The press office of the European Commission and the European Parliament so far remain silent as well. The subject of Gabriel’s cheap home was put on the table as early as 2014 in a question to Sofia Mayor Yordanka Fandakova by the municipal councilor from the Bulgarian Socialist Party (BSP) Nikolay Belalov. In this question, he explicitly asked for information about municipal housing granted to Maria Gabriel. Fandakova’s answer stated that Sofia Municipality did not have municipal housing, did not manage such housing and had not provided municipal housing to Ms. Maria Gabriel. However, Sofia Municipality has a 100% stake in the company Zavodproekt, which in turn owns about 30 apartments. Fandakova’s answer included a statement that “the management of these properties is done for the purpose of generating profit and their leasing is in line with market conditions”. A closer look at the annual financial statements of Zavodproekt reveals that the company is not fulfilling the objective of generating profit. The business of this company has nothing to do with any factories or projects (zavod means factory and proekt means project in Bulgarian – editor’s note), but only with the lease of properties acquired through dubious swaps with the scandalous company Sofiiski Imoti (Sofia Properties). However, over the years, Zavodproekt still managed to accumulate losses. The company owns about 30 apartments, offices and garages, situated in good locations in Sofia. The prices for their rent, as you can see from the list below, are the most enjoyable – enjoyable for the tenants that is. The Sofia Municipality and taxpayers are left to cover the losses. Адрес Тип Площ кв. м. Наемател Договор Наем лв. The most recognizable public figures on the list are GERB MEP Mariya Nedelcheva-Gabriel and Kalin Dikov, who is the brother of the former Chief Architect of Sofia, Petar Dikov. Kalin Dikov is also an architect and despite his enviable financial status, he managed to get an apartment and a garage from the “secret municipal fund” slated for “our people” for just BGN 180 per month. Architect Kalin Dikov did not respond to our inquiries by email, and the phone line in his architectural design office was busy. The other inhabitants of the coveted housing are also connected in one way or another with party bosses and/or employees of the Sofia Municipality, because the list, as our sources say, does not include “random people”. Until we are able to clarify the reason for the granting of cheap housing, we decided to remove the exact address information from this list and only provide initials instead of full names. Obviously, the companies, renting property at prices below any competition, are not random as well. It suffices to say that Eurobuild Bulgaria Ltd is living large in an entire house with a yard on the central Sofia boulevard “Pencho Slaveykov” against the modest BGN 587 per month. The company is not at all poor and has won public procurement in the amount of BGN 30 million, mainly commissioned by… the Sofia Municipality. The same company was chosen to repair the so-called “Bulgarian Louvre”. “HM Consulting” – linked to Eurobuild Bulgaria (the Managing Director of both is Maya Marinova Hristova) – pays only BGN 538 for two 80 square meters apartments and a garage on 47, “James Bourchier” street. Zajvodproekt refused to reveal the current tenant of the apartment on 25 “Nikola Vaptsarov” street, in which Mariya Nedelcheva stored her belongings from 2011 to 2013. However, we still learned that the apartment had not remained empty, and a tenant was found “through an ad, at a price determined in accordance with an updated market valuation prepared by an independent licensed appraiser”. The price also remains secret. It is unknown why the refusal to provide information was framed under the Access to Public Information Act (APIA), although Bivol’s question did not refer to this Act. However, the very fact that this information is being concealed raises new questions and the topic of cheap “storage” for “our” people and businesses cannot be at all considered closed.